vegan food and beer in close proximity! I’ll admit it. I have something of a reputation in SoCal for consuming beer and vegan food. Other than geeky Internet stuff, that’s pretty much all I do. I like to drink before I eat, because I have to consume less alcohol to get a buzz, and can sober up before driving home (I never break my “one beer per hour before I drive rule” that’s served me well since the early 80s). 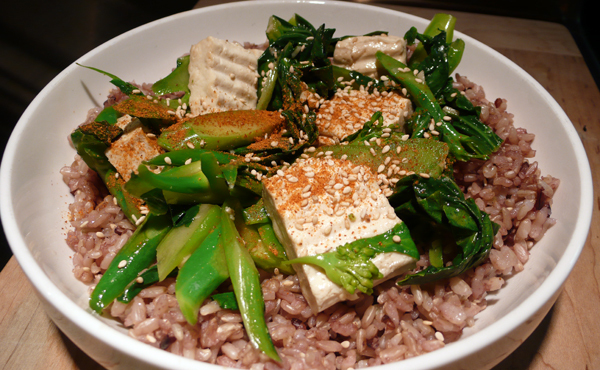 As there are so few bars that serve good vegan food, I usually lean toward good bars within a very short walk of decent vegan restaurants – an intersection of possibilities that’s remote to say the least. Any bar with the word “Tavern” in its name usually implies sticky carpets and flat Bud Lite on tap, but fortunately (as you can see from the exterior photo above) not in this case. 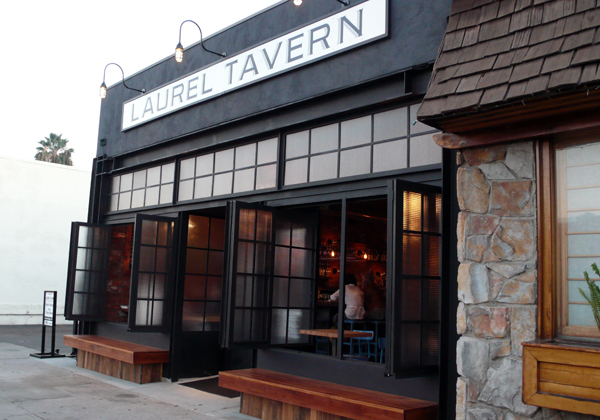 In fact, the Laurel Tavern is a polar opposite of what you’d expect from both its name and location right on Ventura close to the intersection with Laurel Canyon. The inside is hip and cool without making an old man like me feel uncomfortable, and the bar staff are absolutely delightful – polite, efficient and very friendly. 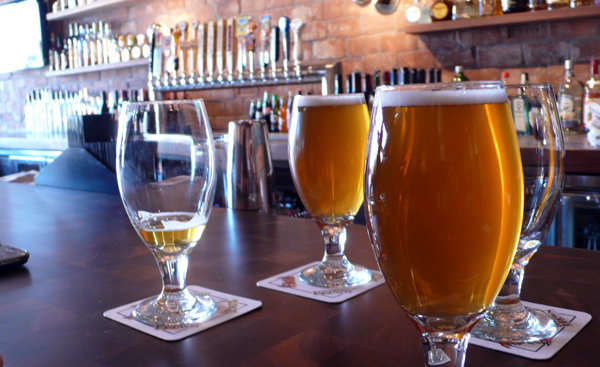 Also, the beer selection is a superb offering of local and national microbrews including the venerable Craftsman ales from Pasadena (including 1903) which are also served cross-town at Pure Luck and have passed the vegan test time and again. Also, at $6 for 16 Oz, they’re a little on the high side for 818-land, but about the same price that us westsiders are used to paying for a brew. craftsman 1903: $6 per 16 oz. pint. So, after a few beers one is likely to be hungry. I won’t even mention the food at Laurel Tavern as it’s gratuitously meaty and there’s nothing remotely vegan on the menu (including the Steak Fries, which are (and I quote) “drizzled with pork fat”). But, to us vegans, a 25 second walk from the Laurel Tavern puts us inside Vegan Plate. I find that the strip mall ambience of Vegan Plate is a little much after such a nice drinking experience so I usually call and order when I’m half way through my last drink then walk over, grab the food and high tail it away from the fluorescent lighting to home, where I gleefully throw a bunch of stuff into a bowl, and wolf it down. As you can see from the picture, the dish is relatively uninspiring visually but actually tastes better than it looks because everything is cooked to order and very, very fresh. ah yes, it’s time for another installment of vegan-thai-restaurants-w/ the word “vegan” in their title, located in los angeles. this time we bring you vegan plate of studio city. first off, the presentation at vegan plate is great—all the food looks beautiful and appetizing. 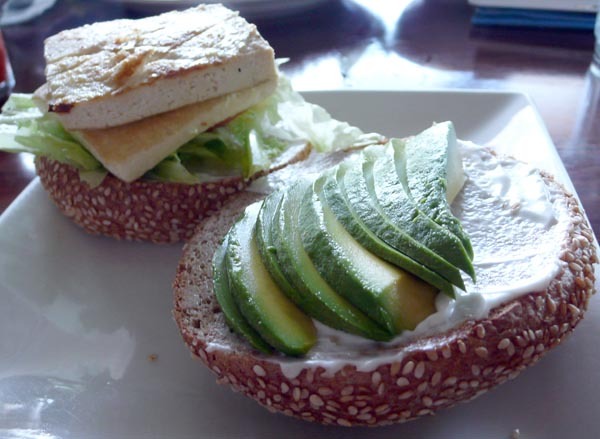 i was quite happy with my luscious tofu burger, and didn’t mind paying an extra buck for avocado, considering the dish was so cheap to start out with. 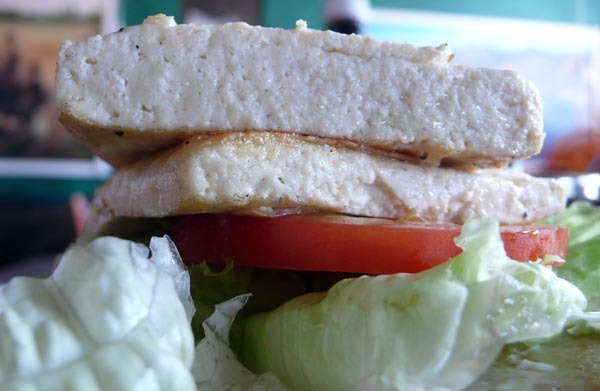 two fat slices of tofu with fresh vegetables and a warm bun meant this burger tasted great, and was a hell of a deal. you see, vegan plate is a place i avoided forever. i guess i went through that “jaded LA vegan” phase of not wanting to indulge all the similar, thai-inspired eateries that litter my stomping ground. plus, it’s located in a strip mall and just doesn’t look too inviting from the outside. 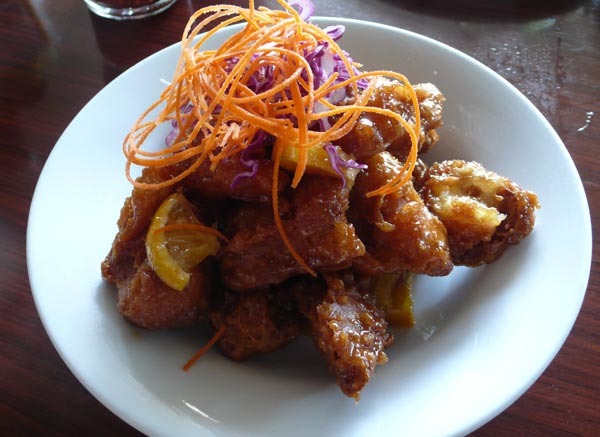 however, one lunch out with my parents at CA vegan and a post about my dad’s love of fake orange chicken inspired fellow blogger foodeater to leave me a comment, stating that the best fake orange chicken around was served up by vegan plate. i had to follow up on this, and decide for myself let my dad decide if she was right. 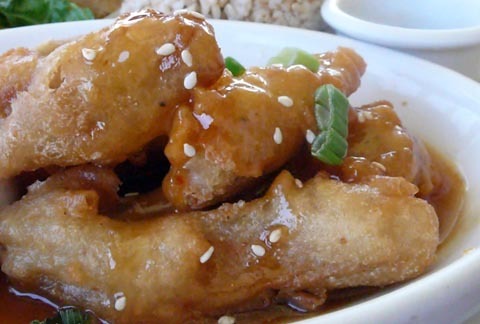 compare to CA vegan’s orange chicken here. 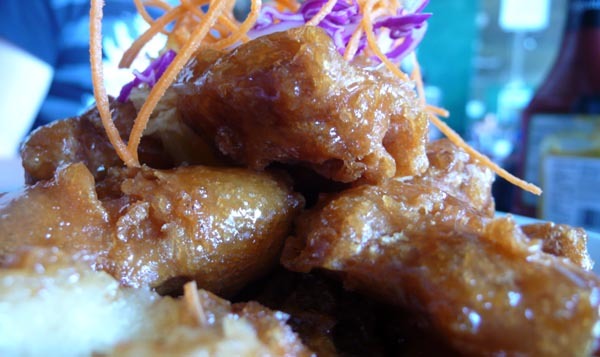 as you can see, vegan plate’s orange chicken is more crunchy and thick…real restaurant quality. less slimy. i would compare this to orange chicken at a fancy chinese joint, and the stuff at CA vegan to orange chicken from panda express. both have their place. this just didn’t taste, well, microwaved. also at the table, mr. meaner opted for the garlic pepper lunch special with seitan. the thick wheat meat tasted more like juicy pepper steak, and was seasoned to please the extreme garlic lover. on trips to the restroom, we could see into the kitchen and witnessed the cook chopping up whole fresh cloves of garlic to be added to the dish. when a restaurant uses the right ingredients, it really shows. nothing tasted canned or stale, all the flavors were spot on. 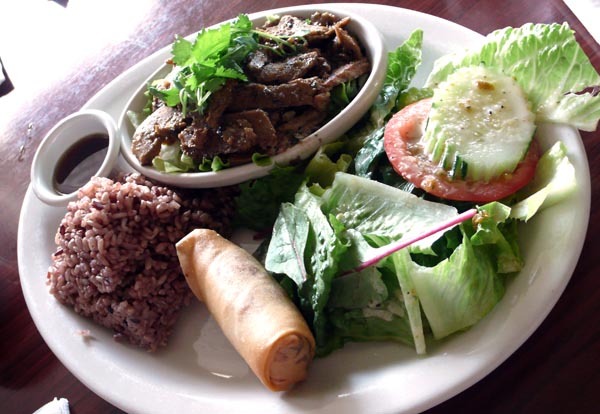 probably the tastiest and most attractively presented lunch special i’ve ever tried at one of the many thai-vegan restaurants in los angeles. highly recommended! even though this wasn’t my meal, i claimed the spring roll as my own and devoured it. also a winner…piping hot, crispy, and just oily enough to taste great but not make me feel racked with guilt.